A Masque of Infamy reviewed in the latest episode of Bling Review along with some other fine publications like Deafula Zine and Xerography Debt, etc… Billy is great and all his video reviews are worth checking out. “[I] discovered ‘Ex-Animation,’ a photo-copied monstrosity that sh-t all over the glorified desktop publication that I had just created. I mean, this thing was rough! Most of the text was written on a typewriter with a few broken keys. The rest was hand-written and pasted half-assed onto the page. The collages and line drawings were primitive at best. The images were oversaturated, as if the creator had made copies with the Xerox machine lid open. And the staples were bent in half from using the wrong kind of stapler and then bending them in half with pliers or something. “Not only was this self-described ‘zine’ the most amazing thing I’d ever seen in print, the writing was poignant and personal. There were short pieces about traveling to England, working as a stripper and getting molested as a kid. Even a few poems. I was blown away. The writing wasn’t polished or stylized. It was just raw. Obviously written without drafts or revisions. Just straight words from the soul. It was apparent that this hot mess existed because it had no other choice but to exist. Which was what made it so compelling. But what astonished me most was the candor. At that time, honesty was very difficult for me. I was all about facades, living in a fortress of fantasy. I wanted to write without reservation, but I was afraid to go deep, in case I exposed the hidden wounds from a f-cked-up childhood and spending my teenage years in institutions and foster homes. Besides, I figured nobody wanted to read about those kinds of experiences anyway. So I kept writing about what was safe: the lost years of my twenties, wasted in a constant state of inebriation, chasing drugs and alcohol with dysfunctional and abusive relationships. And I never used my real name. I put out several more zines before I moved on to chapbooks and then eventually started publishing paperbacks by other writers. In the spirit of DIY ethics, I handled all the aspects of publishing myself, from design to distribution. But I was going nuts from the pressure. And it’s not like I ever had any money. After a while I realized that drive and determination were not enough when the walls were crashing down. So I threw in the towel. 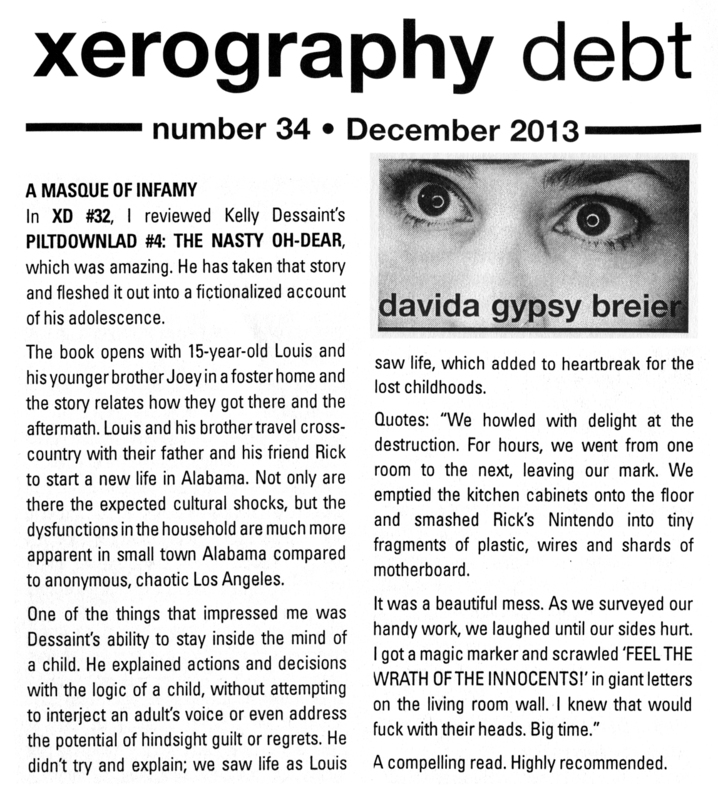 I ended up reading every word of this zine, titled “The Nasty Oh-Dear,” aka “Piltdownlad” issue #4. The author also gave me #1, “The Guero Chingon Stories – Five short tales about growing up a whiteboy in East L.A.”, and #3 “Junior Careers: Adventures of a Teenage Door-to-Door Salesman – Trying to make a buck selling candy in the San Gabriel Valley.” These were completely fascinating and felt like they had been written back at the time they were LIVED; I’m guessing the author kept journals or-? 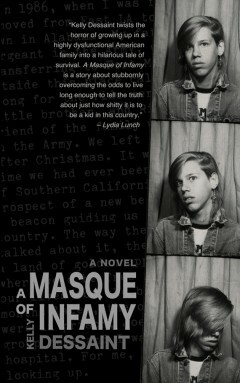 Then I tackled the perfectbound 5″x8″ 307-page BOOK titled “A Masque of Infamy” and it was hypnotizing. I thought **I** had had a bit of a “challenging” childhood, but compared to THIS narrative, I felt I had totally “lucked out.” Finished the book this morning. Understood why he called this “a novel” rather than an “autobiography”-America is far too litigious a society to permit a **true*! * autobiography from ever being published! As publisher-editor of the 1977-79 zine SEARCH & DESTROY, V. Vale helped bring international attention to a Punk scene as prophetic as more publicized ones elsewhere. The publication was launched with $100 each from Allen Ginsberg, and Lawrence Ferlinghetti, and published at City Lights Bookstore, where Vale worked at the time. For Vale, Punk provided a launching pad for a host of cultural-anthropological explorations, including Industrial music, the writings of J.G. Ballard and William S. Burroughs, feminism, pranksterism, studies of The Body, plus “Incredibly Strange” filmmaking and music, which he has chronicled with the RE/SEARCH series of publications that he founded as **sole proprietor** in 1980 (he has the original DBA certificate hanging on his wall). The characters were well developed, the descriptions amazing and a story line that made me laugh and angry at the same time. Read more on The Rooster.